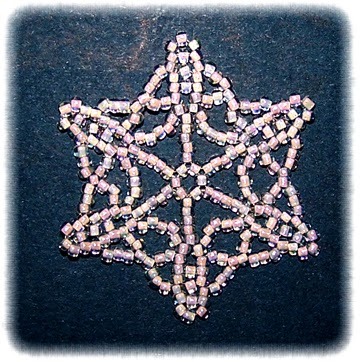 One of my favorite things to bead are Snowflakes. When ever I am stressed, and need something relaxing to do, I make snowflakes. They work up fast and sparkle when held up to the light. 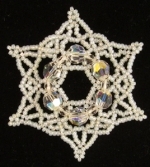 If you use Swarovski crystals and put your snowflake in the windows you will get rainbows on your walls. I try to make each one different just like real snowflakes. No two snowflakes are alike. Start by waxing and stretching your thread. 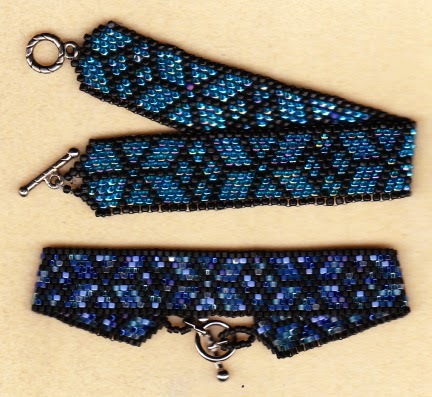 Use Fireline, Nymo D or C-Lon and an #11 or #12 beading needle. Tie in a “stopper” bead, leaving about a 8-10” tail and begin at step #1. I like using Fireline® fishing line, 4lb and 6lb Crystal for bead weaving. 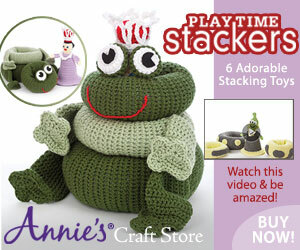 Pick up 6S, make a circle and go with thread through the 1st S bead just added. Continue with working thread around through all 6 beads again, plus go through the 1st bead again. Circle of 6 made, (C6). a) Pick up 12S, go with thread down through the 5th through 1st S beads just added in this step and forward (right to left) through the next S bead in C6. c) Continue with working thread forward through the 1st through 8th S beads in the first repeat of (a) this Round. a) Pick up 3S, go with thread down through the 10th, 11th, and 12th S beads, R2a. b) Pick up 5S, go with thread up through the 6th, 7th and 8th S beads in the next repeat of (a), R2. c) Repeat (a and b) around 5 more times. 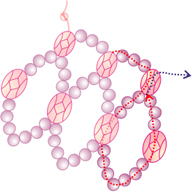 d) Continue with working thread up through the 1st S bead in the first repeat of (a) this Round. 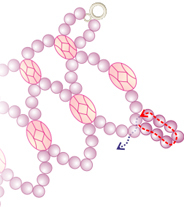 a) Pick up 5S, go with thread down through the 3rd S bead, R3a, the 10th and 11th S beads, R2a. 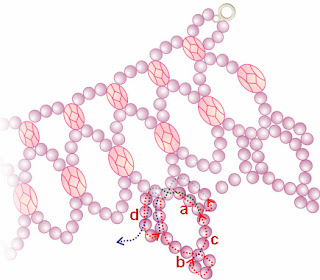 b) Pick up 6S, go with thread up through the 7th and 8th S beads in the next repeat of (a), R2, and the 1st S bead, R3a. 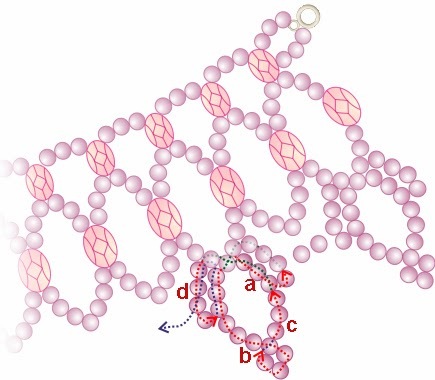 d) Continue with working thread forward through the 1st and 2nd S beads in the first repeat of (a) this Round. a) Pick up 3S, go with thread down through the 4th and 5th S beads, R4a. 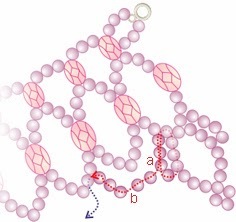 b) Pick up 3S, go with thread left to right through the 3rd and 4th S beads, R4b. c) Pick up 3S, go with thread up thrugh the 1st and 2nd S beads in the next repeat of (a), R4. d) Repeat (a, b and c) around 5 more times. e) Weave the working thread into the snowflake and end. 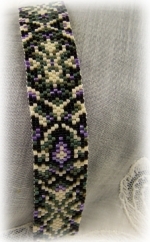 This Stained Glass bracelet pattern is worked in odd count Peyote. 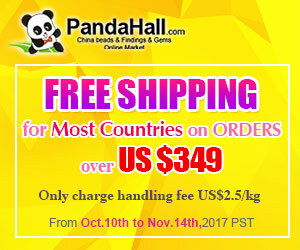 You can find odd count peyote instructions all over the web. Click here to download a PDF of some basic instruction on the peyote stitch. 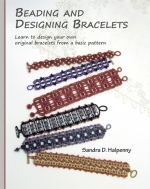 Just finished up my Delica version of Sandra D. Halpenny’s Stained Glass Bracelet pattern. For this one I used matte black beads and a bead mix I got from Bead Obsession here in Albuquerque.You can see how the Delicas give a much more uniform appearance. Still, I like the texture that seed beads give. 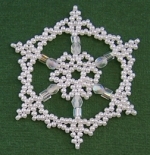 The Lace Lanterns Necklace Pattern is a new pattern that hasn't been released before. I really like the lantern beads but because they feel large and heavy, I don't always know how to use them. This pretty necklace can be worked up fast and with the lantern beads it really sparkles. If you don't have the Lantern beads you can use any 6mm crystals. Hope you enjoy making the necklace for yourself. Start by waxing and stretching your thread, use Nymo D, C-Lon or Fireline and a #11 or #12 beading needle. Tie in a “stopper” bead, leaving about an 8” tail and begin at step #1. 1. Pick up 1B, 3A, 1C, 7A, 1C, 3A, go with thread up through the 1st B bead just added. 2. Pick up 3A, 1B, 3A, go with thread down through the 2nd C bead, step #1. 3. Pick up 7A, 1C, 3A, go with thread up through the B bead, step #2. 4. a) Pick up 3A, 1B, 3A, go with thread down through the C bead, step #3.
b) Pick up 7A, 1C, 3A, go with thread up through the B bead, added in this step at (a). 5. Continue necklace by repeating steps #4a and #4b until you reach the length that you would like. 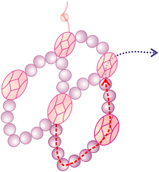 To add clasp, pick up 3A, clasp, 3A, go with thread up through 1 B bead in necklace. 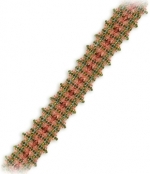 Continue with thread around through the clasp beads several times for strength. Go with working thread down through the beads on the right side of necklace coming out with thread right to left through the 5th A bead added in the last repeat of step #4b. 6. Pick up 7A, go with thread right to left through the 5th and 4th A beads added in a repeat of step #4b. 7. a) Pick up 10A, go with thread forward through the 7th A bead just added. b) Pick up 3A, go with thread up through the 3rd, 4th and 5th A beads, step #6, right to left through the 4th and 3rd A beads, step #4b. 8. a) Pick up 4A, go with thread up through the 3rd, 4th and 5th A beads, step #7a, right to left through the 3rd A bead, step #4b, and down through the 1st, 2nd and 3rd A beads just added in this step. b) Pick up 5A, skip over 1 repeat of step #4b and go with thread right to left through the 5th A bead, step #4b next repeat left as shown. 9. a) Pick up 4A, go with thread up through the 3rd, 4th and 5th A beads, step #8b, and right to left through the 5th and 4th A beads, step #4b. b) Pick up 10A, go with thread forward through the 7th A bead just added. c) Pick up 3A, go with thread up through the 3rd, 2nd and 1st A beads, added in this step at (a), right to left through the 4th and 3rd A beads, step #4b. 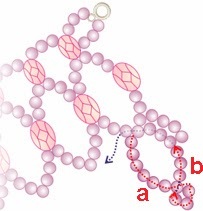 d) Pick up 4A, go with thread up through the 3rd, 4th and 5th A beads, added in this step at (b), right to left through the 3rd A bead, step #4b, and down through the 1st, 2nd and 3rd A beads just added in this step. 10. Continue necklace by repeating steps #8b through #10d to the other end. Add clasp in the same manner as step #5. Weave the working thread into the necklace and end. 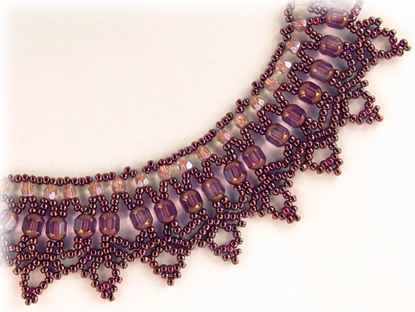 This pattern is another version of the Basic Net Necklace. 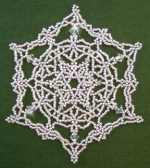 The net weave stitch is an easy stitch to learn and very fast to work up. By adding crystals to a basic necklace adds sparkle and elegance. fishing line also works great for bead weaving. 1st A bead (of the 7A) just added in this step. bead (of the 6A) added in step #1 or step #6.
just added in this step. bead added in step #2. A bead added in step #4.
through the 5th A bead added in step #5. 7. Continue necklace by repeating steps #2 through #6 until the necklace fits. 8. 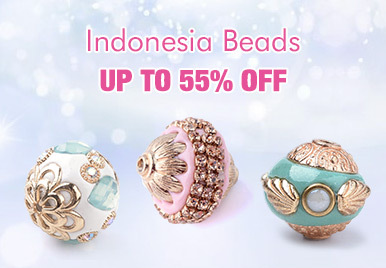 To add clasp, Pick up 4A, clasp, 4A, go with thread up through the 3 A beads in necklace. 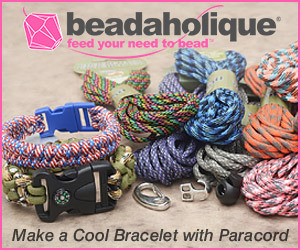 Continue with thread around through the clasp beads several times. Weave in and end thread. Repeat the clasp directions in the same manner on the other end after removing the stopper bead.